The names of the tenants who lived in the stone side of the house after Lucy Grim moved out of the property are mostly unknown at this time. While it is possible that Mildred Lee Grove kept business records of her leaseholders, we have yet to find accounts like that among Miss Grove’s papers containing the names of those who rented the stone side of the property during the second half of the twentieth century. In fact, what we do know of the individuals and families who rented that property over the course of time that passed after the Grim family moved out has been recovered through a combination of research and luck. For instance, on 8 August 2003 we had a visitor from Ridgeley, West Virginia. She came to our museum with her husband and identified herself as someone who had lived in the stone side of the house when her family rented it during the late 1950s. She had been a teenager at the time she lived there and was therefore able to recall some of architectural features of the house from that period. Unfortunately, this woman came during a period when we were not making a point of collecting the names of our visitors, so we have no way of contacting her today. During the 1960s Miss Grove began to consider ways of restoring the stone side of the building to its earlier appearance. Sometime during that decade, she hired the late Mr. Irvin O’Connell, a local contractor and historic home enthusiast to do renovation work on the property. Among the things Mr. O’Connell did was remove the front porch that appeared in the photographs from the time the Grim family were renting the property. Apparently, Miss Grove did not document this porch with photographs or drawings before its removal. We also know that Miss Grove had the first-floor ceiling plaster and lath removed to expose the hewn second floor timber joists overhead. She also had Mr. O’Connell open a passage through the rear stone wall on the second floor into the second floor of the ell addition. Prior to this modification, if you wished to go from the second floor in the front portion of the stone side of the house to the second floor in the rear frame ell addition behind it, you would have to go down one set of stairs to the first floor and go back up a second set of stairs in the rear addition to reach your destination. It is likely that there was a steady stream of tenants who moved in and out of the stone side of the property during the late 1950s through the 1960s. It is not until the 1970s that we start to know some of their names. We should also note that after Nettie Argenbright passed away in 1972 and the Argenbright family heirs sold the log side of the property to Harold & Jean Patton, tenants were also renting the log side of the property. The Pattons did not own the log side for very long and sold it on 13 December 1973 to Poco Associates, a partnership composed of the late Mr. Lewis M. Costello and the late Dr. Tunstall C. Powers. Poco Associates continued to rent out the log side of the property just as Miss Grove leased the stone side of the house to tenants during the same period. It was in this period that Judy and Rodney Wilfong lived in the stone side of the property and the family of Ms. Betty Milhon lived in the log side of the duplex. The Wilfongs lived in the stone side from May of 1974 to September of 1977 and had their first child while they were tenants. They were followed by Ms. Audrey Swope Hollar and her daughter. Mildred Lee Grove transferred ownership of the stone side of the property to the Stone House Foundation in 1990. In June of 1992 the Stone House Foundation purchased the log side of the property from Mr. Lewis M. Costello, the surviving member of the Poco Associates partnership, thus reuniting the two sides of the property once again. The last people to live in the reunited property were called “caretakers.” Winchester photographer Beverly Pearce lived there in 1992 and 1993. 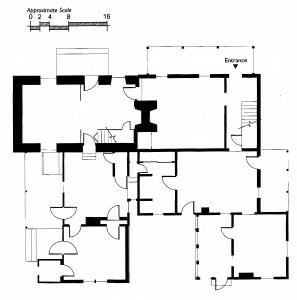 She was followed by John Todd, who was given permission to build a passageway between the two rear additions of the property before he moved out in 1996. After Mr. Todd moved out and Miss Grove passed away in 1997, the work to determine the property’s future as an exhibition building began.